Once again, the Crimson must settle for the consolation matchup next week after losing to the Eagles, 2-1. BOSTON, Mass. — Under the bright lights of TD Garden, anything can happen. As the Harvard men’s hockey team left the ice for a timeout, a last-minute miracle was exactly what it hoped for. 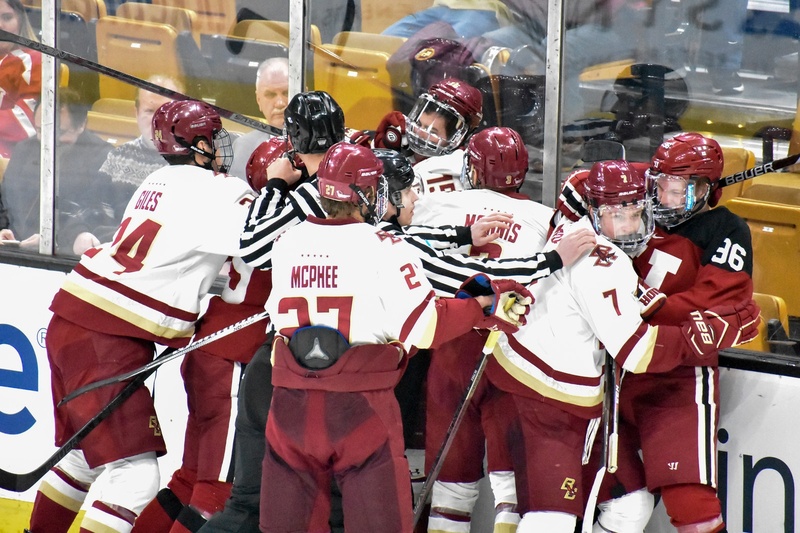 With just 1:57 on the clock, Boston College junior defenseman Julius Mattila was whistled for tripping, putting the Crimson in the perfect position to tie the contest and send this Beanpot semifinal into overtime. The goalie was pulled. 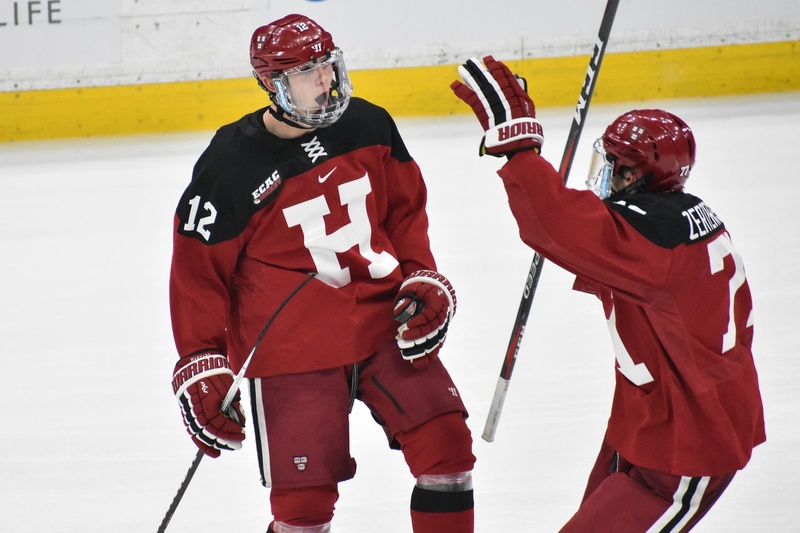 Harvard’s power play unit, the best in the NCAA heading into the matchup, took its position. The following two minutes contained net-mouth scrambles and desperate keep-ins, but no Crimson goal. For the second year in a row, No. 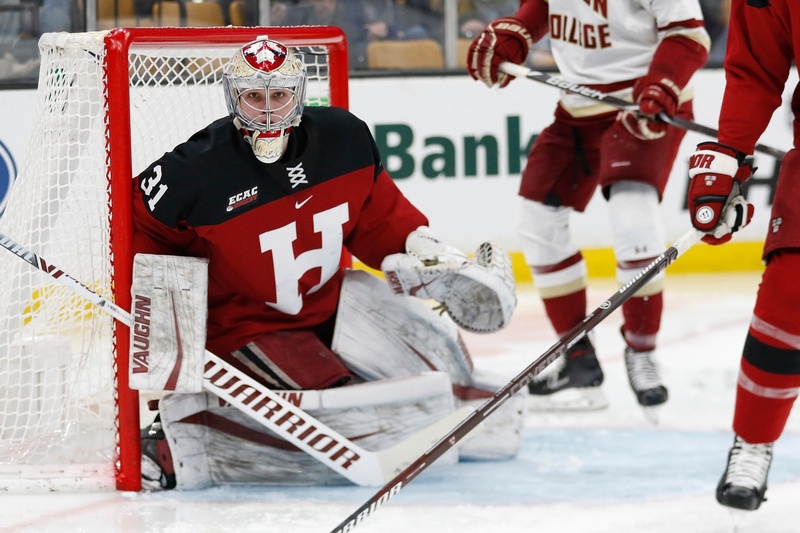 17 Harvard (11-7-3, 8-5-2 ECAC) was served with disappointment at the Beanpot, this time at the hands of the Eagles (10-12-3, 9-4-3 Hockey East) in a tight 2-1 game. 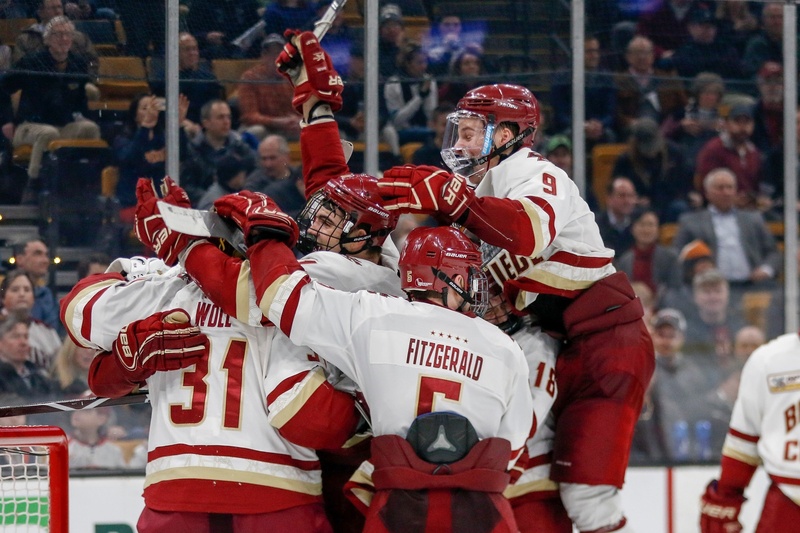 BC nabbed its first ticket to the championship game since winning it three years ago. In the process, the Eagles also beat a regular season non-conference losing streak dating all the way back to 2016. The intensity of the Beanpot is always high, as storied programs with long histories make for fierce competitors. A disjointed first period saw Harvard outshoot BC, 8-5, but the Crimson could not capitalize on either of its power plays. Meanwhile, the Eagles had broken the ice less than five minutes into the contest. A promising rush for Harvard resulted in a turnover, springing three BC players away against a lone Crimson defenseman. Nifty passing courtesy of junior Graham McPhee put the puck on the stick of rookie Patrick Giles in the slot, who lifted it over Harvard senior net-minder Michael Lackey. The tally was Giles’s first career goal, giving his team a 1-0 lead. At the other end of the ice, junior goaltender Joseph Woll was a steady presence for BC, but had not faced a significant threat yet from Harvard’s offense. The team's vaunted man-advantage squad, operating at an efficiency of 34.3 percent coming into the game, hadn’t been able to set up as effectively as usual. Even worse, having already conceded a goal, the Crimson found itself in the box three times in the middle frame. Late in the second period, John Marino's nifty display of offensive talent set up the Crimson's only goal of the game, courtesy of Henry Bowlby. Twice in a row the culprit was sophomore forward Henry Bowlby. But luckily for Bowlby and Harvard, that was not his only mark on the box score. Midway through the second period, junior defenseman John Marino wove his way into the offensive zone, curling behind the net to center for Bowlby in the slot. His attempt beat Woll, knotting the game up at one. The teams traded chances through the rest of that period, but the scoreboard stayed the same for over 15 minutes of playing time. The Eagles broke the stalemate halfway through the third period, again on an odd man rush. This time, rookie Oliver Wahlstrom dropped a pass for fellow freshman Jack McBain, who fired over Lackey’s glove for his sixth goal of the season. Wahlstrom, a former Crimson commit, collected his sixth assist of the year on the play. Harvard still had eight more minutes in regulation to bring the contest back to a tie. But penalties had hampered the team all game, and the crucial next few moments were no exception. Another trip to the box put the Crimson under pressure, and ultimately the squad was unable to regain momentum. The closing 6-on-4 was too little, too late. Despite the loss, Crimson net-minder Michael Lackey continued his stretch of confident backstopping. The senior will be key to Harvard's success down the stretch of the season. The semifinal proved very different from the type of contest Harvard usually plays — and thrives — in. It was low-scoring, low in shot volume, and without a single power play tally. That goes both ways for the Crimson, which has struggled on the penalty kill but went a perfect five for five on Monday evening. BC’s aggressive PK certainly benefited from the standout performance of Woll (.964 SV%), who looked in control throughout the game. The Eagles did succeed in limiting Harvard’s considerable offensive talent. Of the Crimson’s top five scorers, only one, sophomore defenseman Reilly Walsh, picked up a point on the night. The usual suspects, like junior blue-liner Adam Fox and rookie forwards Casey Dornbach and Jack Drury, were held to three shots each, though Fox did hit the pipe with one of those tries. Meanwhile, co-captains Floodstrand and Lewis Zerter-Gossage, who stole the show against Dartmouth on Friday, were held to two shots and one shot respectively. Harvard’s own defense corps blocked 17 BC attempts on the night, but could not entirely keep the Eagles to the perimeter — both BC goals came from the slot. 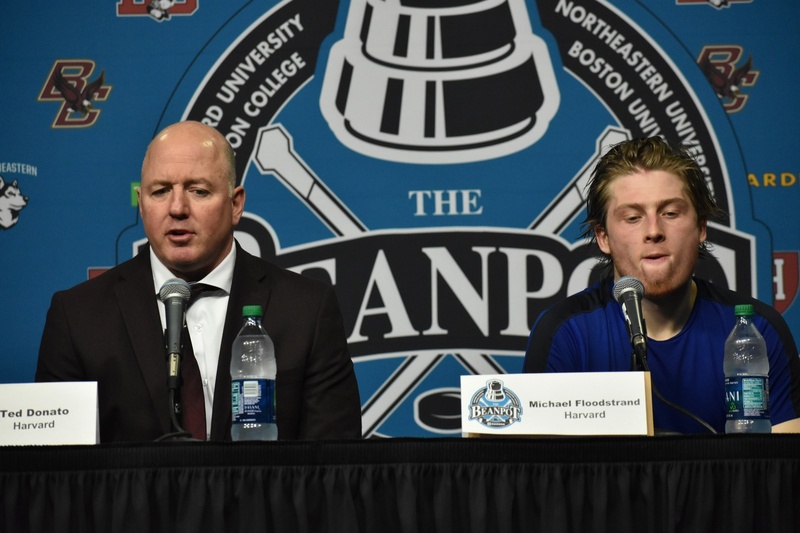 Harvard coach Ted Donato and co-captain Michael Floodstrand were both disheartened and frustrated after the disappointing loss. A consolation game awaits the Crimson next Monday, against the loser of the semifinal matchup between Northeastern and BU. But while the team’s Beanpot hopes have been quashed, conference play continues this weekend against No. 20 Union. If Harvard wants to fulfill its playoff aspirations, it will need to regroup quickly and return to its winning ways. —Staff writer Stuti Telidevara can be reached at stuti.telidevara@thecrimson.com. Follow her on Twitter @StutiTelidevara.